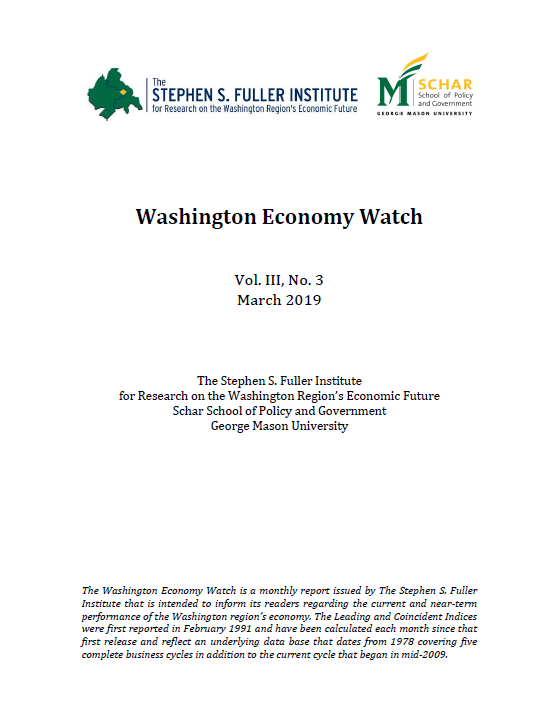 Washington Economy Watch provides local business and government leaders with a consistent analysis of Greater Washington’s regional economy to ensure they are equipped with the information needed to make informed decisions regarding the future development of the region’s economy. Following the onset of a recession in July of 1990, a region-specific early warning analytical framework was developed to ensure public and private sectors leaders could better anticipate changes in the direction of the local economy. The Washington Economic Index has been calculated each month since February 1991 and reflects an underlying data base that dates back to 1978. The Washington Economic Index is the only metropolitan–level Index (consisting of Leading and Coincident Indices). The Washington Leading Index forecasts the performance of the metropolitan area economy six to eight months in advance based on a combination of regional indicators, including unemployment, consumer expectations, retail spending, and residential building permits. The Washington Coincident Index represents the current state of the metropolitan area economy based on a combination of regional indicators, including wage and salary employment, consumer confidence, retail sales, and domestic passenger volume. 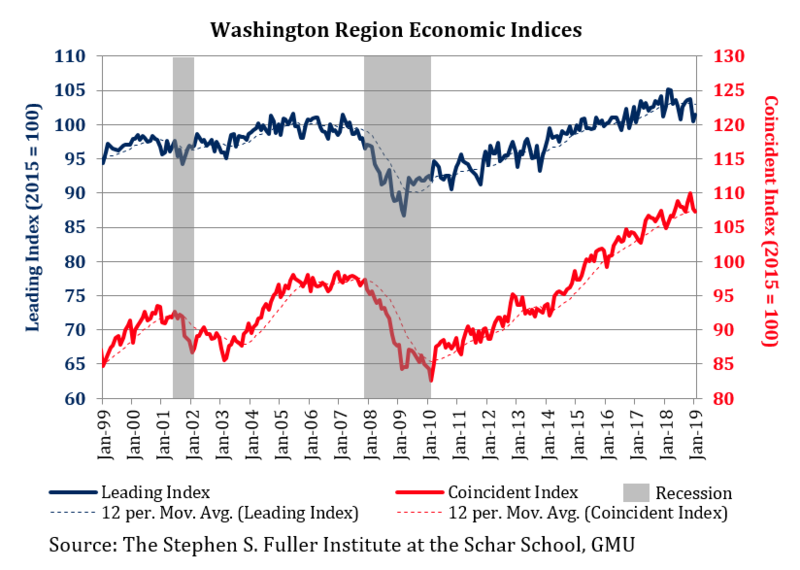 Each month, The Stephen S. Fuller Institute will report on the status of these key indicators to ensure regional leaders have the most up-to-date information in regards to the current and near-term performance of the Washington region’s economy. Recalculation of the Washington Coincident Index to reflect revised job estimates shows the region’s economic expansion to have continued through 2018 but that it followed a slightly lower trajectory than previously reported, especially over the year’s last six months. The Leading Index has continued to track negatively since mid-year 2018 with this pattern now extending through January 2019. These trends clearly raise questions concerning the economy’s outlook this year. Looking forward, a slowing U.S. economy in 2019, now expected to grow only 2.1 percent, may result in the Washington region’s economy growing at a slower rate than previously projected.